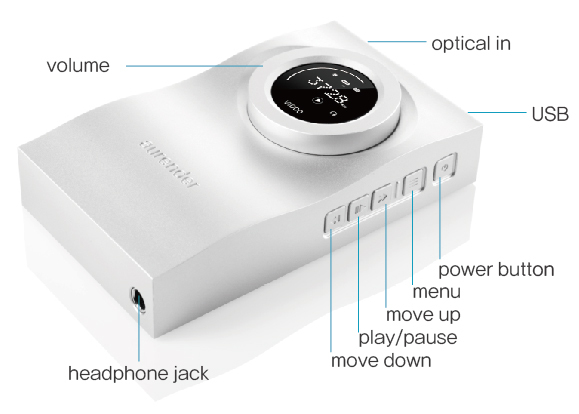 Recently there has been a bit of a drive to make the portable amplification and decoding device relevant again in the face of the all-conquering DAP revolution headed by the likes of Astell & Kern, FiiO and Ibasso to name but a few. 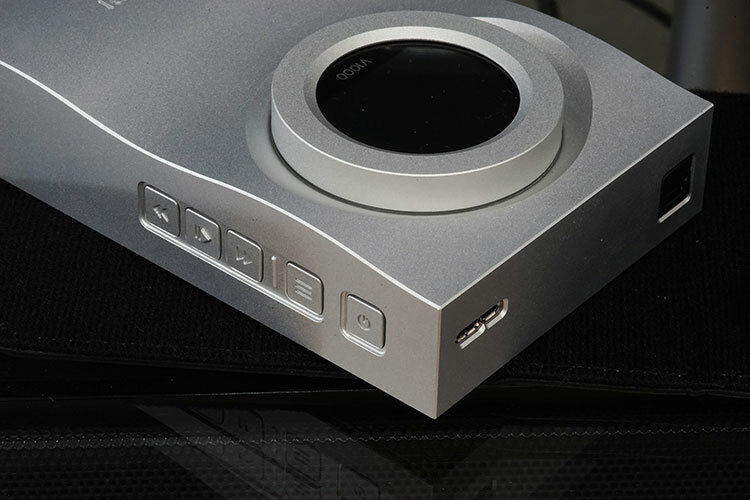 Chord and their mighty Hugo was one such variant that claimed to go that extra mile your high end DAP and make it sound truly special as well as play a central role in your desktop system that was as good if not better than purpose-built desktop units. Aurender from Korea, better known for their snazzy music servers and component systems have opened up a 3rd channel now focusing on what they call “Personal Entertainment”. The first such product from this new channel is a transportable convergence device much like the Sound Blaster E5 from Creative but on a whole other “audiophile” level and priced at $1295. This is no mere dip in the ocean for Aurender; this is feet and all given the pitch and price. The question is does this make the right ripples or is it a $1k belly flop? The concept and purpose of the Flow is to bring together all your audiophile amplification and decoding needs under one well-constructed unit and with that the Flow is packing technology and accessories that allow you to connect it to a very broad range of audio sources as well as itself becoming a source component (DAC) and feeding another independent amplification to a very high level, DSD128 native in actual fact. Oddly enough it does not come with a lightning cable for iOS devices which would have completed this cable party in a box extravaganza. In fact, Aurender have taken a rather old school (and dare I say cheaper licensing route) with the Flow’s iOS connectivity by simply instructing you to buy the good old USB Camera kit to properly connect the Flow to an iOS device such as an iPad or an iPhone. 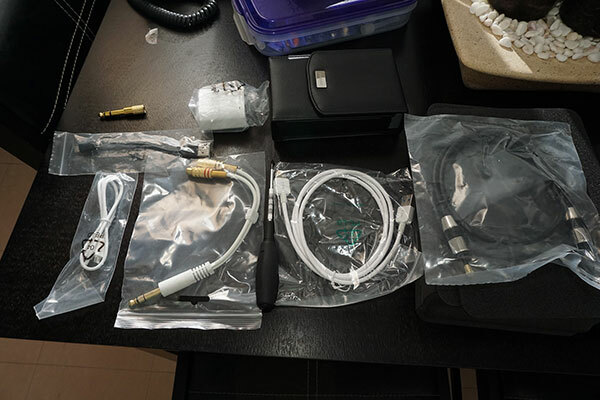 I flirted with buying that once until the likes of Cypher Labs came along and said no need, we bought the license and here is a small convenient cable. So this will not be the first time I allude to the total cost of ownership but if you are an Apple fan, as always be prepared to pay that little bit extra to set up the Flow with your iGadget. The Flow is also created with an added unique selling point of being able to pack in an mSATA drive up to 1TB in memory size as a functional reservoir for storing your reference tracks and music in general and acts as a secondary hard drive when plugged into your laptop or PC of choice. Rather handily Aurender have included a high quality Vessel screwdriver for allowing you to conduct your minimal DIY requirements to open up the base of the Flow and insert the mSATA much like you would on the Hifiman HM-901 by simply slotting it in and then closing it all up. You will be required though to format before you begin loading it with music of your choice. It is a memory driver after all so you can take with you anything really on the drive and access it later on your laptop or desktop PC or Mac should you need to. I can see benefits of this in terms of always being able to bring your favorite tracks around with you regardless of the laptop or PC/MAC you plug it into it. It is also less bulky than carrying around a spare USB portable drive though these days a 2TB drive is quite small in form factor but ahhh those darn cables connecting everything in the cheap solution. However, I can also see drawbacks given the total cost of ownership of a Flow. Including a 1TB mSATA drive pushes it up by almost another $400 making even the hardened spender pause for a few moments on whether it should be included or not. The fact that Aurender shipped the Flow out without any mSATA included makes me feel Aurender already considered this as a possible barrier to a successful market entry given the added price and sensibly left this as something the end user could either buy into or not depending on their budget. Scanning the local flea markets in PC and storage accessories and the cheapest I could find was a 128GB for around $50 used. Not bad at all and puts the price closer to microSD prices but then again it does make you wonder why not add a MicroSD card slot or two like FiiO and AK and carry around 128Gb for a whole lot less? 1TB does sound imperious but at $400 it could be a case of the “Emperor’s New Clothes” for many. 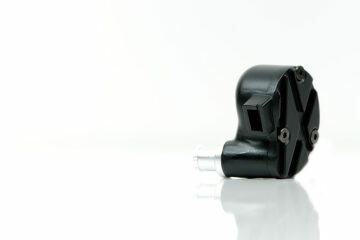 That scarcity of inputs and outputs, as well as the mSATA storage space, makes the Flow a rather uniquely designed portable device. Portable is probably a slightly stretched term in relation to other devices such as say the Theorem 720 or even the budget Creative E5. It does indeed have a Li-ion battery but rated at a somewhat as only acceptable in portable terms at 4450Mah which is half the capacity of the smaller Theorem 720 which sports a gargantuan 8700mAH battery. True enough the Theorem 720 does sell on the ability to adequately charge your mobile phone or mobile device but it is still rated at 18 hours playback time compared to the rather shorter rated 7-9 hours (possibly lower depending on usage) of the Flow. Long periods of portable usage on long flights, long journeys or even just a day’s solid listening without going anywhere will come up a bit short unless you can plug it into a PC or its AC plug at some point in the journey or the day. Secondly, the weight, size and the rather offbeat design of the Flow do not make it the most stackable or pocketable of devices. I personally love the design, it’s unique and stands out amongst the crowd but it is really ‘form over function’ so this emotive applause from me may not be shared by others. The washing machine meme has indeed been used more than once by fellow local forum members and encouragingly the members have not lost their unique sense of humor by backing it up with a washing powder accessory fake ad in our FB Group. Love it as I do it is rather hard to escape that image once someone mentions it. Central to that meme is the rather fetching central display console and integrated volume dial which Aurender terms as “Velocity Sensitive Volume & Playback Control”. Sorry but I love this even if the execution is not quite up to the promise I still think of it as some sort of spare bit from the Enterprise flight control system. My hand rests so easily on this. If you remember The Island from ALO Audio and how I really like the ability to work the volume without taking my eye what else I was doing then this is the same sort of concept from Aurender for the Flow. Except on the Flow the volume works on a digital db scale rather than an analog pot and starts at -110db and works itself all the way up to 0db with a default start at -90db. It does not retain the previous volume when you power down in the memory nor can you select a default starting volume. The sweet spot for me using 32ohm or thereabouts IEM’s seem to be around -50db. To be frank I found the starting point of -110db impossibly low for most things I had with detectable audio indeed starting at -90db but nothing I could appreciate or monitor until around -55db or -50db. That is a heck of a lot of -db at the really low end unless you like your music dead quiet to almost nothing. After around -35db things get a bit too loud for comfort. That is rather a small sound level sweet spot for those using medium efficiency IEM’s and customs like myself. There is, of course, a bit more give for headphones but powering the more demanding Alpha Primes the sweet spot didn’t’ really take hold until about -30db and got decent volume levels at -20db. Yes, there is power, good power but I got the feeling half the pot was a bit wasted in just getting there. The whole velocity sensitive system mechanics though are quite smooth moving up faster as your hand moves the dial around faster. Mind you on an analog pot that is just physics and your finger dexterity combined but for a digital pot it is a nice touch and the Flow is setup to be very accurate and linear in the pot control which is very pleasing also. 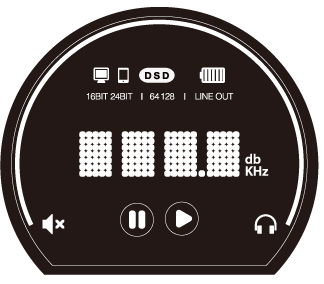 The Flow’s button arrangement is to the right-hand side and they consist of a bracket of 3 playback control buttons(play,/pause, back and forward), a menu access/selector button and a power button. They are built flush into the side panel of the Flow which does a good job of minimizing any disruption to the aesthetic. They are also pretty tactile in their response and the raised bevels give a nice indication of which button to touch or press without looking down or double checking. There must be a bit of a blooper either in the driver, firmware or the button physical config though as forward = back and back = forward when controlling via the DAC function connected to my PC. It is not a huge issue and one which I got quite used to but it did guive me pause for thought. Aurender explained this to me by saying that in actual fact they viewed the control as relative to the headphone jack facing the listener and therefore a more natural flow and not an error. The Menu and control settings of the Aurender Flow are indeed controlled by the physical buttons with the display GUI in the middle of the volume dial panel. The Flow menu system controls both the type of connection you want to use and the default you want it to revert to upon boot up. For example, USB or optical can all be adjusted via the menu button using the forward and back buttons for default selection and source management as well as the mSATA management. You can also check your battery percentage levels, the USB host mode itself, whether to charge during playback or not, the display brightness and the firmware number. 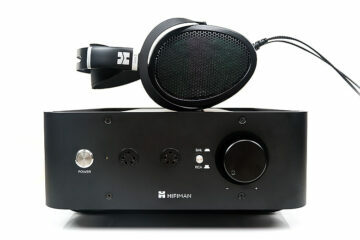 The final option is the VAR option which is not really affected by headphone use since it covers the output jack and selecting line out or headphone out. It can detect a headphone automatically and you will not be able to change anything which is a handy safety feature but if connecting to amps you can change the voltage output from 2V to 5V or back again depending on how much voltage you want to output to the amp of choice. The Flow display, small as it is, covers just about every option I could need for source information and what option I am selecting and it is one of the better displays I have seen recently. The Flow is built to cover a very wide range of resolutions using a Sabre ESS9018K2M DAC (32-bit/384kHz with DSD64/128 capability). Lossy MP3 right up to DSD128 is all covered so it is very handy indeed to be able to see from the display what my format is and resolution of that track that is playing. Outside of that it can tell me what my modality of connection is such as DAC, Android, optical or iOS. It will also display my current playback mode (play or pause) as well as whether I have a set of headphones plugged in or its in line out mode. The battery icon will also blink when in charge mode as well as using menu to see actual percentage. Its top notch and well thought out by Aurender and the quality of the LCD itself is excellent with a very wide viewing angle. Even as I slouch in my chair, and I do that a lot, being almost parallel to the display I can still read it with minimal ease. Can I play/access the music stored on the internal hard drive using an iOS device? Sadly I never tested the Flow with SSD into an iOS device to see if it can dual read the memory and playback audio. The expense of installing and treating it as a portable device for connecting with Apple gadgets never seemed that appealing.